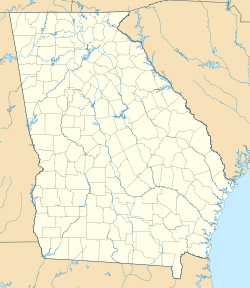 Bristol is an unincorporated community in Pierce County, Georgia, United States. Bristol is located at the intersection of the concurrent Georgia State Route 15 and Georgia State Route 121, which runs north-south through Bristol, and Georgia State Route 32, which runs east-west. Bristol is 10 miles (16 km) north of Blackshear. Bristol is also known as Lightsey. A variant name was "Lightsey". The Georgia General Assembly incorporated Bristol as a town in 1914. According to tradition, the present name is after Bristol, in England. Bristol's charter was dissolved in 1995. ^ a b c Krakow, Kenneth K. (1975). Georgia Place-Names: Their History and Origins (PDF). Macon, GA: Winship Press. p. 25. ISBN 0-915430-00-2. ^ Acts and Resolutons of the General Assembly of the State of Georgia. State printer. 1914. p. 493. This page was last edited on 24 April 2019, at 19:24 (UTC).